Here's a great short chapter book or junior novel for young readers! Billie B. 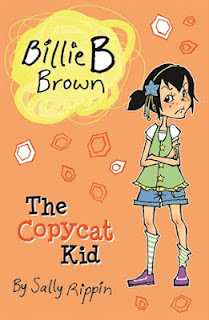 Brown: The Copycat Kid was written by Sally Rippin, illustrated by Aki Fukuoka and published by Hardie Grant Egmont, 2012. *and lots of white space. The Billie B. Brown books not only have these features, but they're fun and engaging for kids. Take a look at the number of comments from grateful parents on Rippin's blog if you need proof. The books are set in a world, and with a feisty heroine, that children can relate to. Kids will like that Billie B. isn't perfect and gets into realistic scrapes. Parents will like that Billie B. is honest and she means well. Fukuoka's illustrations in Billie B. 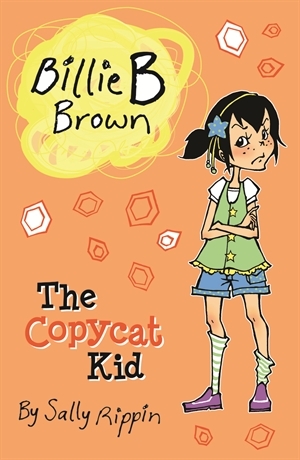 Brown: The Copycat Kid are cartoon-style line sketches that add humour and emotion to the story. They also help young readers understand what's going on when it comes time to decode a new word. I love books that help switch kids onto reading. The Billie B. Brown books do just that! Voracious young readers will gobble up the many titles in the Billie B. Brown series. They're a great choice for home or the school library. And as icing on the Billie B. cake, make sure your kids check out the Billie B. Brown website, especially the boredom busters there. I gave this book to my daughter who is 7 years old. She loved it. She reads it before sleeping.